A semi-serious romantic comedy, Maggie's Plan brings the subgenre down to earth with wry humour, a sprinkling of originality and flawed characters all around. Maggie (Greta Gerwig) works as a liaison between students and business at an arts college. Unable to find a long-term relationship, she decides to have a baby using the donated sperm of pickle merchant Guy (Travis Fimmel). But she then meets and falls in love with anthropology professor John (Ethan Hawke), who is married to haughty Columbia University Professor Georgette (Julianne Moore) and the father of two young children. John is writing his first fiction book and finds Maggie an inspiration. John divorces Georgette, marries Maggie and they have a child of their own. But it does not take long for the magic to disappear from their marriage, and John's book project comprehensively stalls. Georgette is jilted, but remains in close touch with John, leading Maggie to hatch a new plan in her quest for happiness. 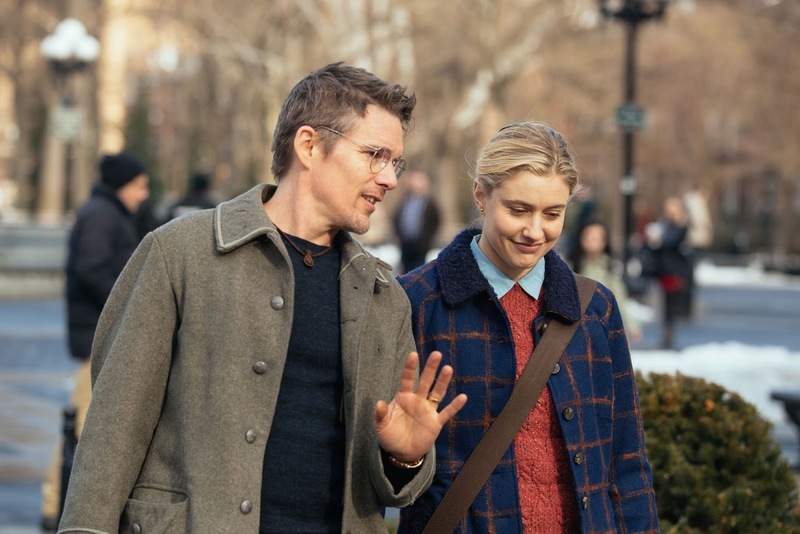 Directed and written by Rebecca Miller, Maggie's Plan breathes organic life into the eternally tired rom-com formula. This is a story about three adults entering the midstream of life and carrying plenty of baggage, ranging from unmet expectations to ticking biological clocks, and more than capable of making a brand new set of mistakes. In celebrating the quirky foibles of her characters, Miller sidesteps most of the cliches that beset idyllic romances desperate to generate laughs. Maggie always has a plan and always over-plans, a trait she recognizes but is unable to control. The plot is a succession of Maggie plans, from artificial insemination to marrying John and finally finding a way out of the misery of a marriage she thought she wanted. Greta Gerwig is delightful as the self-aware Maggie, always ditzy enough to make a right-sized mess out of every situation. Georgette, to Maggie: I don't know what to say. You're a funny person. There is something so pure about you. You know, and a little bit stupid. And it's a kind of innocence. You know, just so unconscious. I can't help it. I like you. Georgette is controlling, arrogant and yet loving and passionate, and Julianne Moore luxuriates in a Scandinavian accent and a complex performance as a smart woman deservedly dumped but only slightly resentful. John is mainly oblivious to the emotions of others and needs something different from each of Maggie and Georgette, the former an intellectual superior capable of pushing him and the latter a cheerleader and muse. Ethan Hawke is sympathetic as the struggling academic trampled by two women at a more assertive stage in life. Maggie's Plan maintains a low-key, grounded tone, the humour anchored in the consequences of intricate life altering plans that sound good in concept, but never quite unfold as intended. This movie seems to be the perfect film to watch on a Friday night! Greta Gerwig is very talented, not only as an actress but also as a screenplay writer and as a director. Lady Bird was quite good. As far as romantic comedies go, this is one of the better ones. And yes, Greta Gerwig is a treasure on both sides of the camera. After reading this post, I watched it and I agree with you!